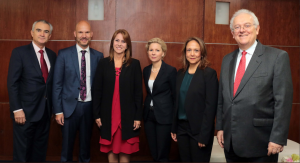 The Colombian Ministry for Labour, headed by Minister for labour Griselda Janeth Restrepo Gallego, together with the Swedish Embassy in Colombia hosted a Regional Tripartite Seminar on Global Deal on 22 May. The Seminar in Bogotá gathered participants from 18 countries, including ministers and vice-ministers from Colombia, Panama and Guatemala as well as representatives from trade unions and employer organisations. The purpose of the seminar was share experiences and good practices among different social partners from the region. This is exactly in line with one of the purposes with the Global Deal – to create platforms for sharing experiences. During the meeting, the Ibero-american Social Security Organization (OISS) joined the Global Deal and several other countries and organisations declared their strong interest in joining Global Deal. The meeting was part of Colombia´s voluntary commitments to the Global Deal. In addition to the country representatives, the ILO Regional Director for Latin America and the Caribbean, José Manuel Salazar Xirinachs, also participated in the meeting, as well as José Antonio Ocampo, Senior Advisor to the Global Deal and co-director of Colombia´s central bank. Sweden was represented by Global Deal Ambassador Sofia Östmark and Sweden´s Ambassador to Colombia, Tommy Strömberg, as well as Karin Åker from International Council of Swedish Industry and Alex Nicolau from The Swedish Trade Union Confederation/ The Swedish Confederation of Professional Employees. The day after the Seminar the Swedish Embassy hosted two meetings for Colombian labour market representatives and representatives from Swedish businesses in Colombia respectively.